Regardless of the varying opinions on rising young actor Nam Joo Hyuk‘s acting talent, or lack thereof, he continues to get prime acting gigs one after another this year. On the heels of being the male lead in the KBS teen identity mystery drama Who Are You: School 2015, then landing a supporting role in the much talked about drama adaptation of the webtoon Cheese in the Trap, now he’s batting three-for-three and just landed a part in an upcoming MBC long prime time drama. Nam Joo Hyuk has confirmed to play the younger counterpart of the male lead character in the MBC drama Glamorous Temptation, and joining him as his teen first love romance leading lady will be Kim Sae Ron. 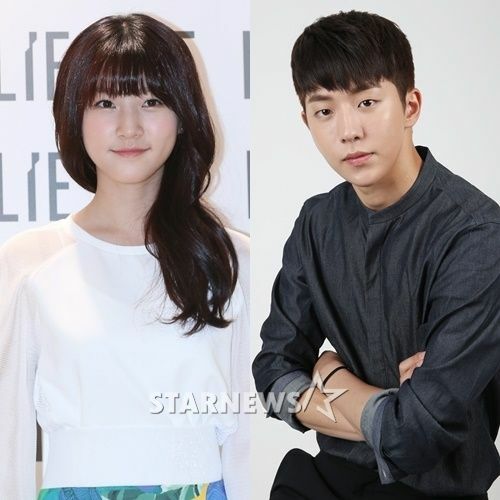 Nam Joo Hyuk first gets Kim So Hyun in School 2015 and now gets Kim Sae Ron? He seriously has no excuse not to keep improving his acting when he works opposite such lauded child actresses. Glamorous Temptation will follow the currently airing 50-episode sageuk Splendid Politics (Hwajung) and will also run for 50-episodes despite being a modern drama. Recent word on the street was for Choi Kang Hee to play one of the two leading ladies, but when the casting news broke earlier this week her agency denied emphatically and said she turned it down. I’m so lukewarm on her, the news of her declining actually makes the drama remain potentially interesting for me. The plot revolves around two high school girl friends whose lives cross paths in uncomfortable ways after they grow up when one becomes the stepmother to the other. Eeks. There is family strife and even revenge thrown into the mix, making this sound way more like a makjang weekend fest much like MBC’s May Queen and Golden Rainbow, and funnily enough Glamorous Temptation will be penned by that very screenwriter who wrote those dramas. It’s been a long time since a big three network has scheduled a 50-episode modern drama in a prime time slot, and this one reportedly will have ten episodes devoted to the teen portion which is where Kim Sae Ron and Nam Joo Hyuk will play their parts. Casting should be finalized shortly with production beginning by early September. 50 episode dramas are, with few exceptions, a crime against drama watchers. Absolutely not interested in the story or in that format. As for the male actor we are talking about here: Bland, uncharismatc. My sentiments exactly. He didn’t stand out in Surplus Princess. Even with his bigger role in School 2015, he was constantly overshadowed by Kim So Hyun and Yook Sung Jae. I feel like YG played a part in getting him main roles despite his inexperience. They’re really trying to push him into becoming the next successful model-turned-actor. Even on Dramabeans you’ll see people excusing this casting by saying that he’s cute. Imagine if they cut actresses a third of that slack! He* and it’s sad ,you can tell the kdrama fan base it made up of a bunch of young girls. Can Ji Soo get some of this attention? I need to see him again pronto and he fits the same teenage range that Nam Joo Hyuk is filling. It would be so great if Jisoo was actually the lead instead of Joohyuk. He was okay in School 2015 but like others said, Sungjae and Sohyun had so much chemistry together that he entire drama became everyone rooting for second lead Sungjae. I agree! I lovee Jisoo, I love Kim sae ron as well. So 2 of them on one screen will be awesome! If jisoo cant make it because he busy filming for his upcoming movie, can we have kwak dong yeun instead? i miss him..
this guy was so bore in school 2015. the second lead left him in the dust in acting. only reason he even get lead role in school 2015 is cuz of yg paying big money to the pd of the show.